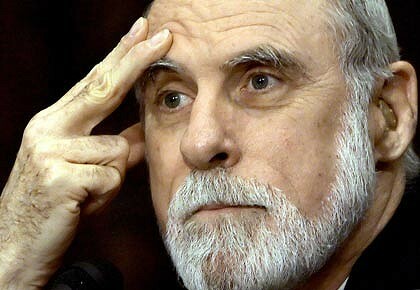 Google’s vice-president and chief internet evangelist Vint Cerf. The “father of the internet” says the world is going to run out of internet addresses “within weeks” – and it will be all his fault. Google’s chief internet evangelist, Vint Cerf, who created the web protocol, IPv4, that connects computers globally, said he had no idea that his “experiment” in 1977 “wouldn’t end”. “I thought it was an experiment and I thought that 4.3 billion [addresses] would be enough to do an experiment,” he said in group interview with Fairfax journalists. The protocol underpinning the net, known as IPv4, provides only about 4 billion IP addresses – not website domain names, but the unique sequence of numbers assigned to each computer, website or other internet-connected device. The explosion in the number of people, devices and web services on the internet means there are only a few million left. The allocation of those addresses is set to run out very shortly but the industry is moving towards a new version, called IPv6, which will offer trillions of addresses for every person on the planet. “Who the hell knew how much address space we needed?” Cerf said. Cerf said Google’s surprise leadership shake-up was essential because the search giant was beginning to move too slowly. Today the company announced that Google co-founder Larry Page would take over as chief executive from Eric Schmidt, who has become its executive chairman. Until this point Page and co-founder Sergey Brin ran the company with Schmidt as a “troika”. “‘As we got larger it was harder for us to move as quickly as we would like so I think this is part of the whole practice of speeding up decision processes,” he said. Recent ex-Googlers who left the company to join Facebook, including former Google Australia engineer Lars Rasmussen, have said Google has become too unwieldy as it has grown. Schmidt gave similar comments in a blog post today, saying that, as Google had grown, managing the business had become “more complicated” and the trio had been “talking for a long time about how best to simplify our management structure and speed up the decision making process”. Cerf said Schmidt, 55, had been chief executive for 10 years – “a nice round number” – and Page, now 37, was ready to lead the company well into the future. “Larry and Sergey are 10 years older than they were when they thoughtfully hired Eric to be the CEO … so everybody’s growing up,” Cerf said. It has long been held that Schmidt was brought on at Google to counter the lack of business experience of Google’s founders, and Schmidt alluded to this in a tweet today. “Day-to-day adult supervision no longer need!” he wrote after the leadership change announcement. Cerf would not be drawn on whether Google was developing a social networking site to compete with Facebook, as has been rumoured. But he said “our interest is less in the social networking aspect as it is in the patterns of behaviour”. “We really don’t care about you personally we care about the patterns that you make. If we can match the patterns that you make with the patterns that the advertisers are trying to get in front of you, you benefit as well as the advertisers,” he said. Cerf heaped praise on the National Broadband Network, saying Australia was making a long-term investment that would “serve you incredibly well in ways that even I can’t figure out”. “The idea of being able to export your talents without having to export your people … this is a very attractive proposition,” he said. But despite Google’s work in building municipal Wi-Fi and experimental fibre broadband networks in the US, he said it was unlikely Google would ever become an ISP. “The intent is that as we build these [networks] out we will then turn them over to some other parties to operate and to make openly accessible,” he said. Asked whether recent privacy breaches at Sydney University and Vodafone – both of which kept detailed customer records online – highlighted the pitfalls of moving toward hosting everything in the online “cloud”, Cerf said the cloud was not at fault. “Just because it’s sitting in an enterprise server doesn’t mean that you’re any better protected than you would be in the cloud,” he said.